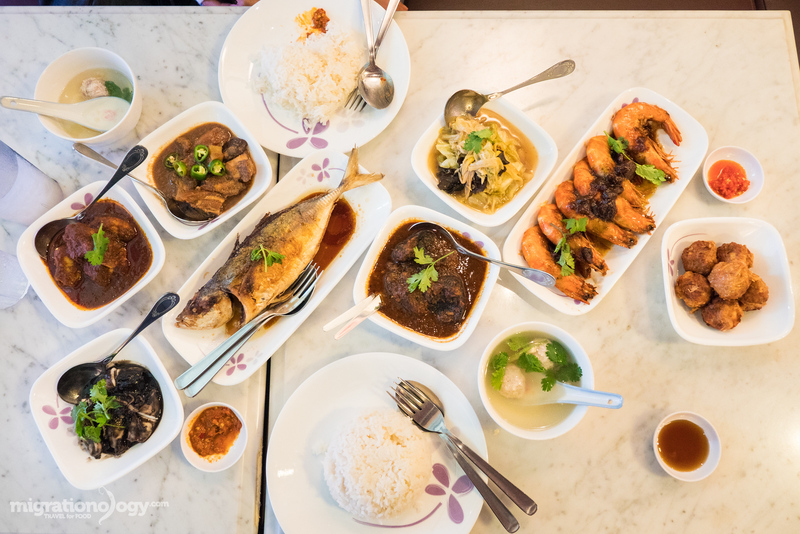 Peranakan food is an incredibly special blend of Malay and Chinese cuisine. And if you love bold and exciting combinations of ingredients, the taste of strong herbs and chilies, and explosive flavors, you’re going to love Peranakan dishes. 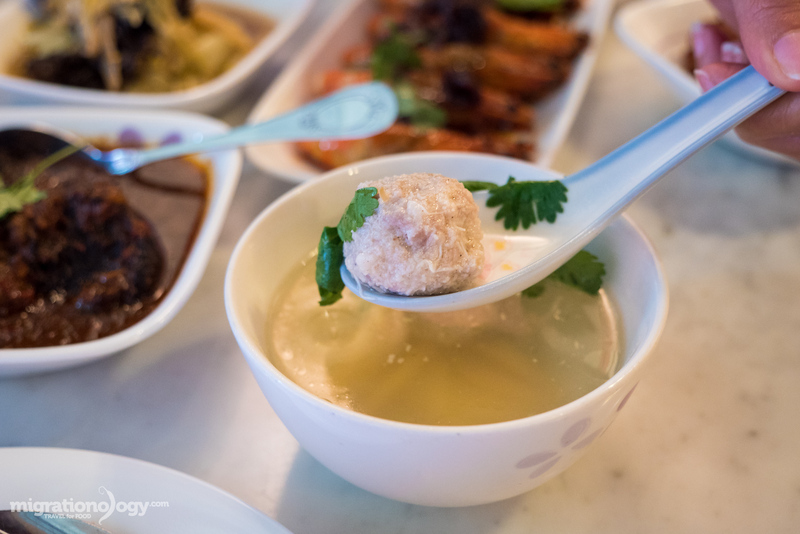 So when I was in Singapore, I had the chance to eat at Daisy’s Dream Kitchen, and the Peranakan food they served will not only blow your taste buds, but the entire family and hospitality they show are equally as inviting. I’m not an expert on Peranakan history, and I won’t fully get into it in this post. But for the most part Peranakans refer to a group of people who are Straits (as in the straits of Malacca) born Chinese. So they are a group of Chinese descendents (many originally with roots in Hokkien, Teochew, or Hakka) who migrated to parts of Singapore, Malaysia, Indonesia, and southern Thailand. Peranakans have a very unique culture and blend of both Chinese and Malay, and even more influences like British, Indian, and Arab. One of the ultimate things about the mix of Peranakan culture is the food. 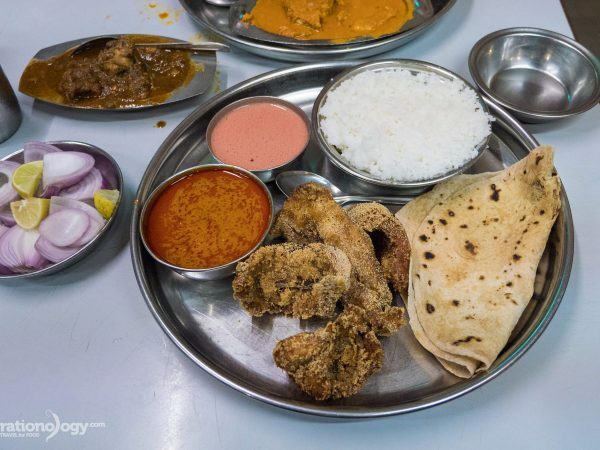 Their cuisine is full of natural ingredients you’ll find throughout the Malay peninsula, paired with both Chinese and Indian cooking techniques, and packed full of flavor. NOTE: Within the Peranakan culture, men are referred to as Baba and women are referred to as Nyonya. And so oftentimes you’ll see Peranakan food referred to as Nyonya cuisine, though they refer to the same food. I’ll be using Peranakan food throughout this post. Daisy, the owner and principle cook at Daisy’s Dream Kitchen restaurant, always loved to cook for her family and friends. It was her dream to eventually open a restaurant, where she could cook Peranakan food and serve others the same delicious food that she served her family, bringing more people joy through her cooking. At first Daisy began her restaurant as a hawker food stall at Tiong Bahru Market, in the center of Singapore. When she started out, due to the small facility, she could only offer a couple of different Peranakan dishes per day. 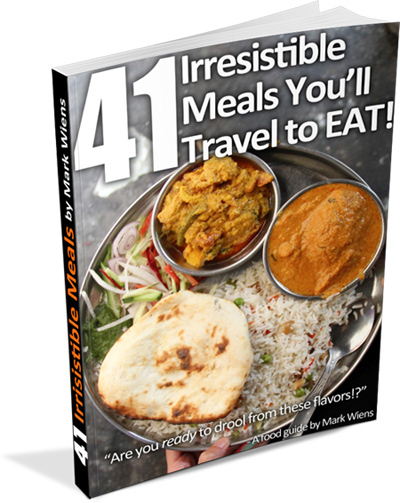 Also check out my Singapore Travel Guide for Food Lovers! After a year of serving food at Tiong Bahru, Daisy, along with the help of her sons Ray and Roy, moved to a permanent indoor restaurant facility on the west coast of Singapore at Clementi. Daisy’s dream was to bring people together through food, and Daisy’s Dream Kitchen is that incredible reality. 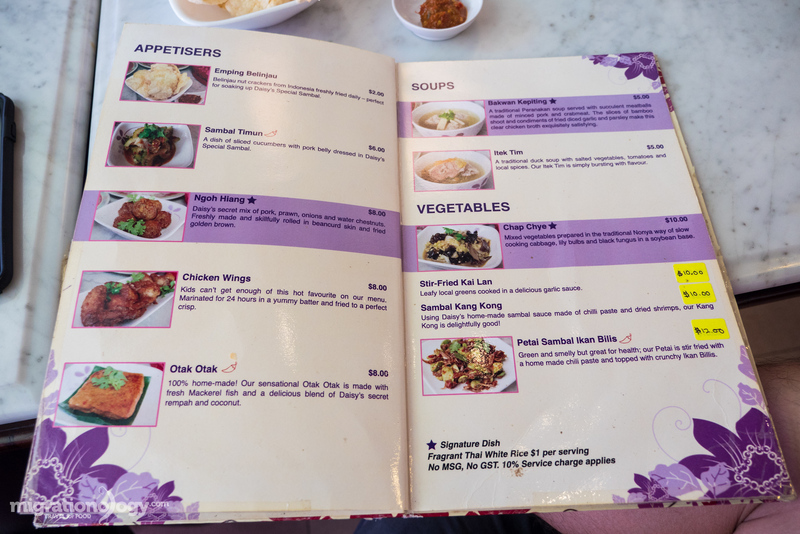 The menu is easy to read and follow and it’s extensive with plenty of dishes to order, but at the same time it’s not too huge where you can hardy navigate the menu. What I liked about the menu is that there was a nice and clear description of each of the dishes, including the main ingredients and method of preparation. When I ate here, Daisy and Roy suggested some of their most well known dishes, and brought out a range of their specialities for Ying and I to try. 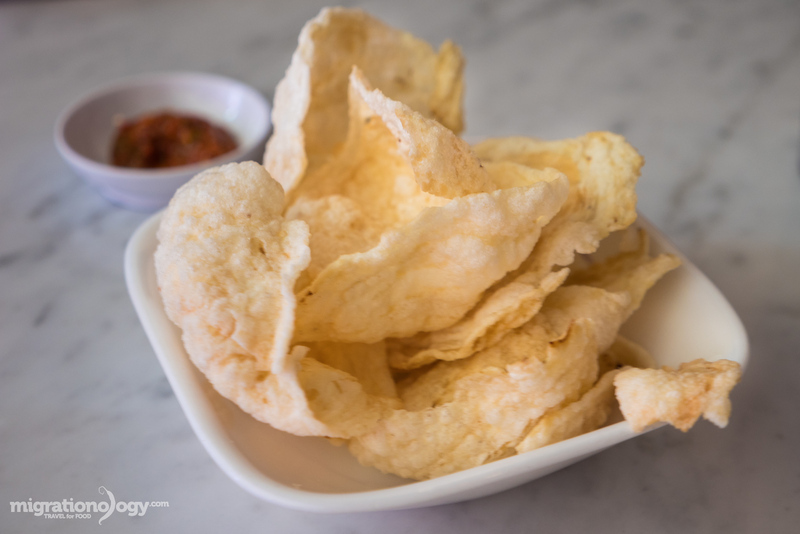 We started off with some emping chips and sambal to dip them in – sort of like chips and salsa to begin the feast. Emping chips are similar to shrimp chips, but they are made from the melinjo plant. They are very crispy and slightly airy, not heavy at all, and make a wonderful crispy snack. But what I really loved about eating the chips was the sambal belacan (similar to Thai nam prik kapi) it included a stunning blend of chilies and shrimp paste. It was slightly spicy, fragrant and salty from the shrimp paste, and balanced perfectly. 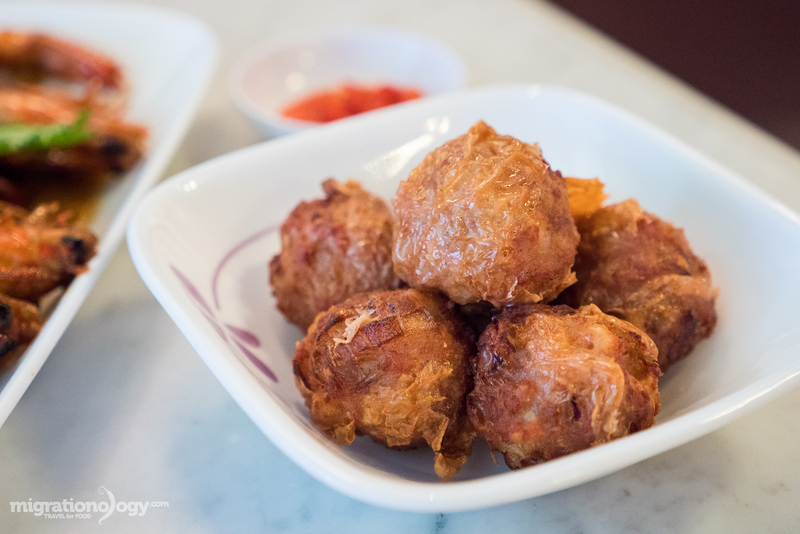 Ngo hiang are little meatballs made of minced meat and shrimp, water chestnuts, wrapped in bean curd, and then deep fried until golden. I had no idea what to expect when I took my first bite of ngo hiang, I thought they were going to be just ordinary meatballs. 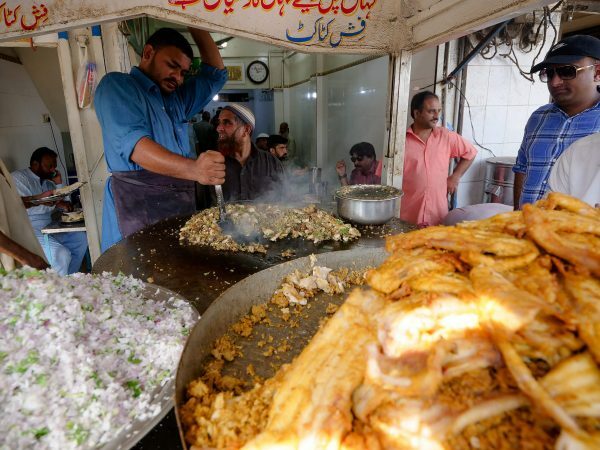 But they were instead extraordinary meatballs – I could taste onions and the crisp texture of the water chestnuts, plus a wonderful mix of both minced pork and shrimp. I think the beancurd wrapper and then being deep fried, acted to seal in all the flavor, so biting into the little meatballs, they just exploded with flavor. This was another dish Ying and I started our meal off with were bakwan kepiting, minced pork and crab meatballs, within a soup that included bamboo shoots and cilantro. This was probably the least spicy filled dish of our meal, but it was truly amazing as well. The meatballs were so well balanced with a mix of minced pork and crab, and they were seasoned lightly with just some salt and pepper I think. The delicate flavor was what really made them so good. 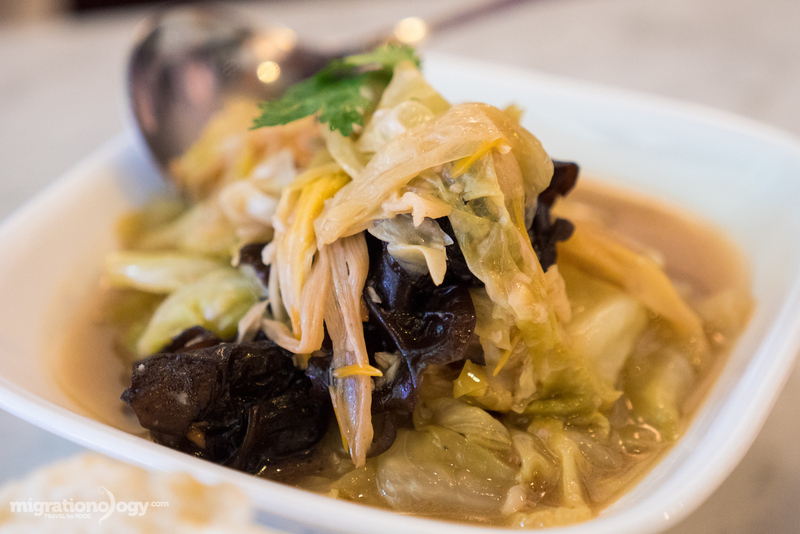 Similar to tom jab chai (ต้มจับฉ่าย), a dish I frequently eat in Thailand, chap chye at Daisy’s Dream Kitchen was a soft vegetable stew that included mostly cabbage, some type of lily bulbs, and also black mushroom / fungus as well. It was a soothing taste, soft and easy to go down. According to the menu, there was a little fermented soy bean paste in the recipe, but that was very mild, just adding a hint of a saltiness to it. I liked the natural sweetness of the cabbage, and also I could really taste the mushroom flavor. I’ve been a stink bean (also known as petai) fanatic since I moved to Southeast Asia, and when I’m at home in Thailand, especially during season, I eat stink beans almost everyday. I can’t get enough of them, and if I have the chance to order them at a restaurant, I find it irresistible not to. Petai have a very unique taste, and have a very crisp texture. 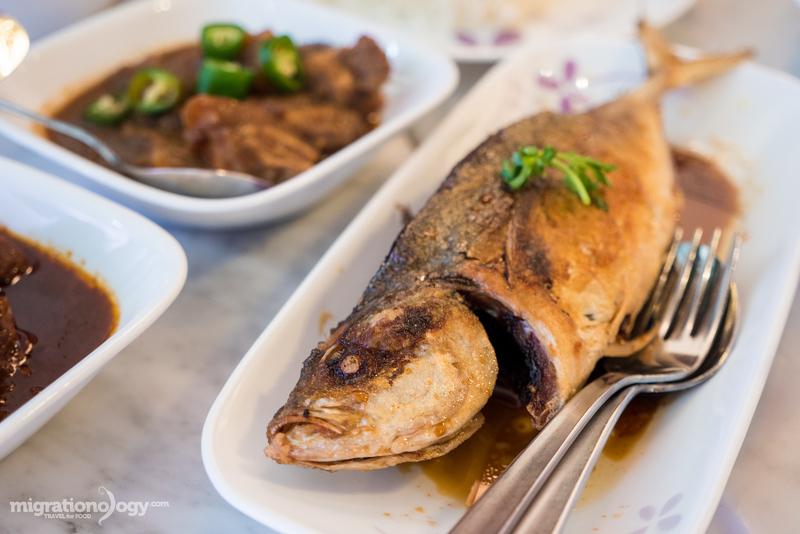 They are often eaten with strong chilies and shrimp paste, and in Singapore and Malaysia they are often fried with chili sauce and crispy anchovies. 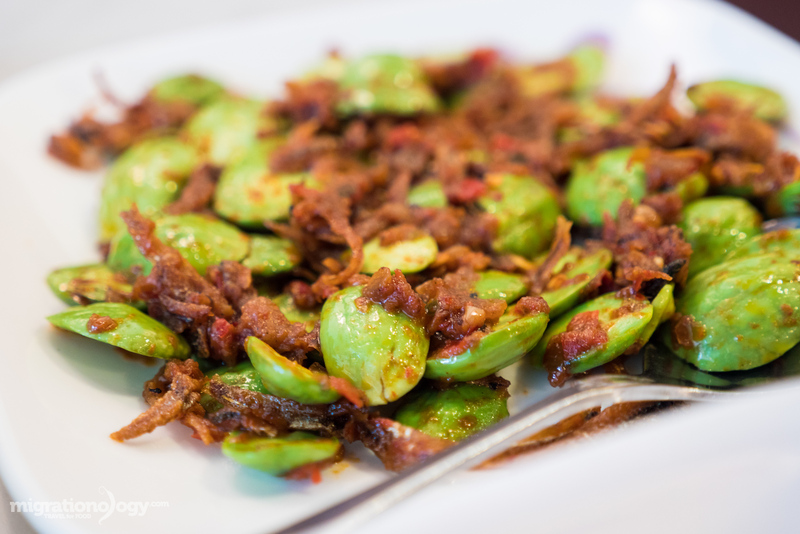 Naturally, because of my love for stink beans, the petai sambal ikan bilis was one of my favorite dishes. But even so, it was prepared very well at Daisy’s Dream Kitchen. The petai were just slightly cooked, so they remained fresh tasting and crispy, and the sambal was spicy and salty, balanced with shrimp paste, but not sweet. And finally the anchovies were crispy and salty, and coated in all the sambal. 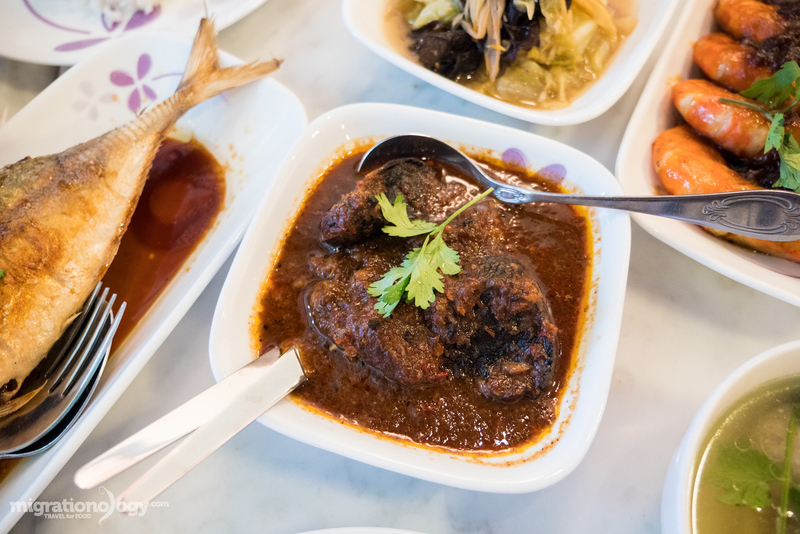 A popular Peranakan dish is assam, or tamarind, which can then be cooked with a number of different base ingredients. We had both the assam prawns and the assam chicken. 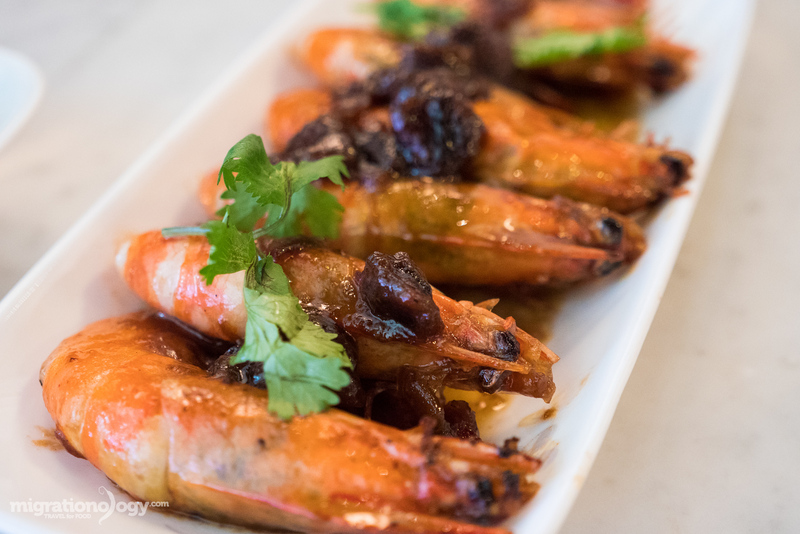 The assam prawns included a plate of beautiful prawns, shell on, covered in a salty fruity tamarind sauce. To me, sweet tamarind almost has a raisin, or jam flavor to it, but in a very natural fruity kind of way. The tamarind was both sweet and sour, and salty, a perfect way to complement the meaty firm prawns. Also, the assam chicken was very good, with a similar fruity tamarind sweet and sour taste, but it had more of a gravy curry sauce to it, rather than being more dry like the prawns. Both were good, but I would have to give it up for the assam prawns. 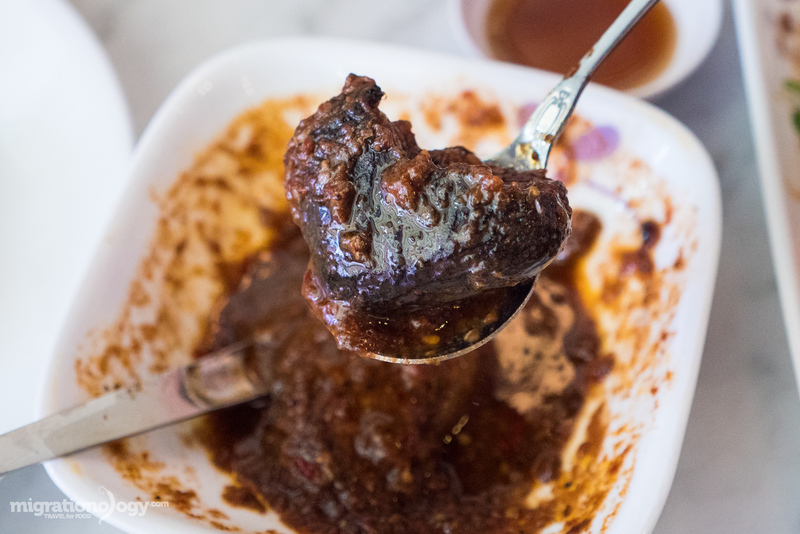 While all the Peranakan dishes we had at Daisy’s Dream Kitchen were fantastic, there’s one dish that truly stood out to me: babi buah keluak. Not only is it one of the signature dishes at the restaurant, but it’s also a well known a classic Peranakan dish, and as the menu puts it, “a must at any Peranakan feast.” And I would wholeheartedly agree after trying it for the first time. While serving it, Roy explained to me how they prepared it, and about the keluak nut that the dish is based upon. I was immediately fascinated. Buah keluak is a type of nut or seed from a tree, which actually contains poisonous hydrogen cyanide. In order to make them edible, the nuts have to go through a process of being buried in the ground, then washed and cooked in a certain way. The nuts, although popular to eat, are very laborious to prepare. At Daisy’s Dream Kitchen, they took out the meat from the nut, then mixed it with minced pork, then filled it back into the nut, and prepared them in a tangy curry with pork. The buah keluak nuts were about the size of a gold ball, just smushed down a bit, and sort of in a heart shape. Inside, the meat almost looked like black couscous, very fluffy and almost bread-like. It had an incredible flavor, that tasted somewhere between dark chocolate cake (without the sweetness) and rye bread. Others have said it has a taste similar to truffles or even coffee. It was an incredible dish, and something I could hardly get over how unique and amazing it was. 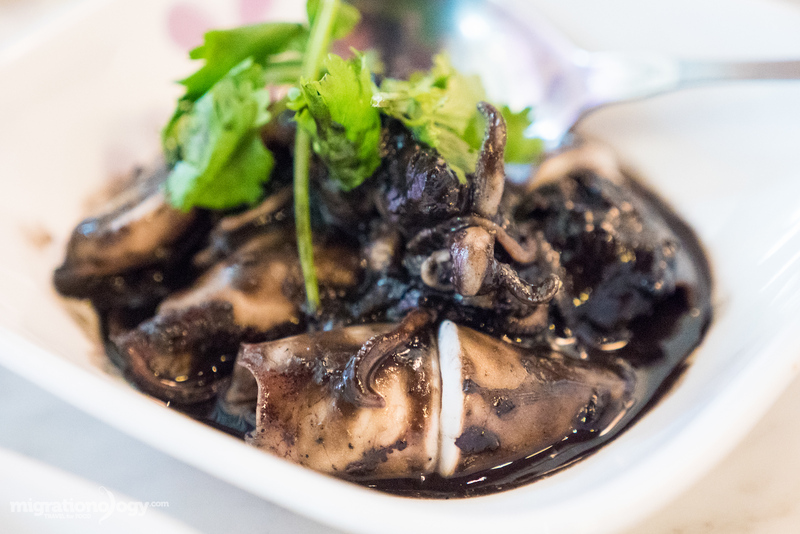 Using baby squid, along with their black ink, the squid was cooked in a blend of tamarind sauce and spices. The flavor wasn’t spicy, but it had a wonderful sourness to it, balanced by being salty and just slightly sweet. What I also really loved with the squid itself, which was incredibly tender and soft, almost to the point of being like chicken. It was again a delicious dish, and it was one of my wife’s favorites of our meal. For our final Peranakan dish we had a small fish, first stuffed with a sambal chili paste blend, and then deep fried. I’m a huge lover of fried fish, and this was excellent. The insides of the fish were really fragrant with the sambal, perhaps including chilies, and a blend of fragrant herbs. It was deep fried until crispy, and there was a salty soy sauce like glaze poured over it. The fish was crispy on the outside, still moist in the middle, and really flavorful. By this point in our Peranakan meal, I was getting pretty full, but we also got to sample some of their famous desserts, starting with the bobo chacha. 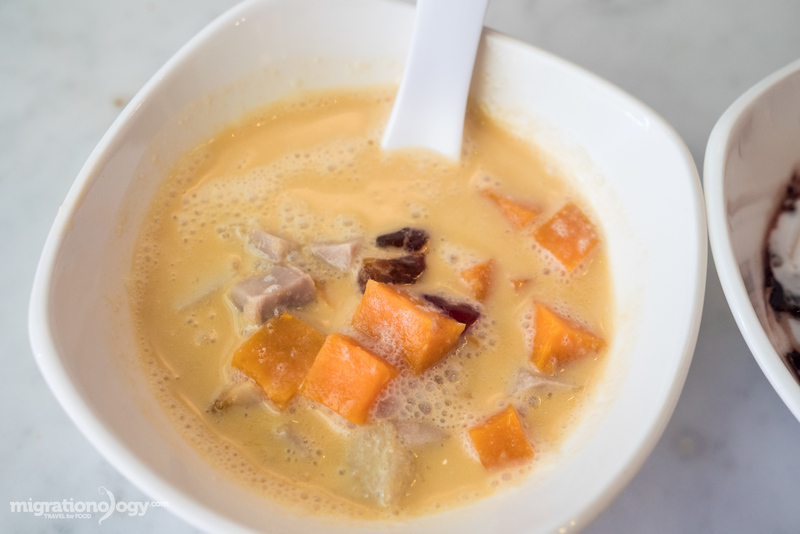 The bobo chacha included cubes of yam, sweet potato, and sago, all simmered in rich and sweet coconut milk, and served slightly warm. It was excellent, and my wife really loved it. 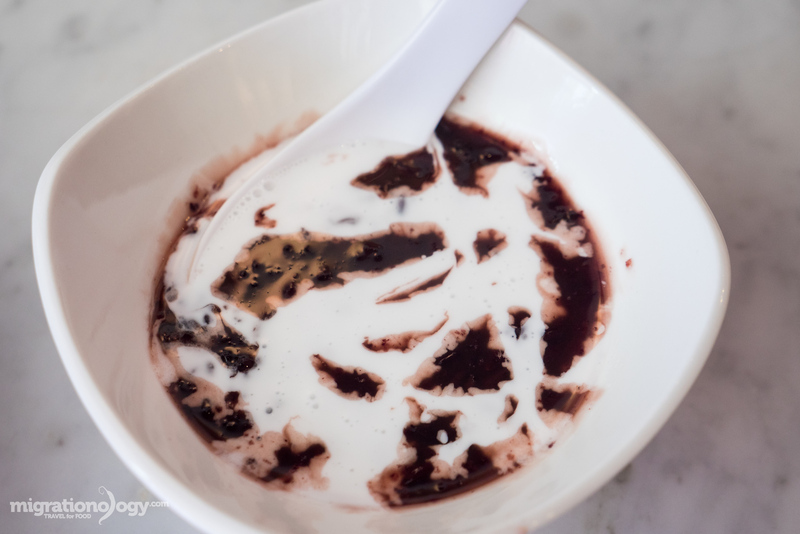 And finally, we had a dessert called palut hitam, black glutinous rice in a pudding like consistency, mixed with fresh coconut cream. This was easily my favorite Peranakan dessert I’ve ever had. It wasn’t too sweet, and the glutinous rice was like pudding with grain textures from the rice, and the never failing addition of pure fresh coconut cream. If you have a few minutes, press play below to watch the full video of this meal. 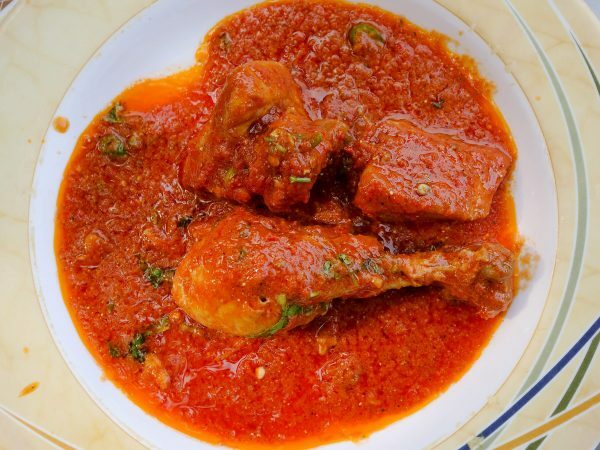 Peranakan food is a unique and special blend of Chinese and Malay ingredients, cooking techniques, and flavors. 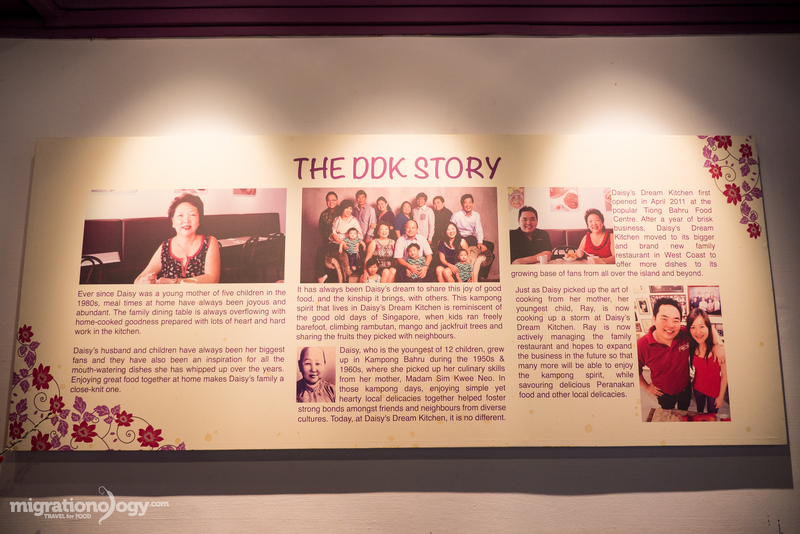 When I was in Singapore I had a chance to eat at Daisy’s Dream Kitchen, a home style family run Peranakan restaurant. Daisy’s dream was to open a restaurant to be able to bring joy to others through food, and at her restaurant, not only will the food excite and thrill your taste buds, but the warm hospitality will also make you feel right at home. There are so many delicious foods to eat in Singapore, but Peranakan food for me ranks as one of the finest meals you can eat. What a great blog! I can see that I’ve got to broaden my horizons. I love to go new places and try new things, but am a little bit of a chicken when it comes to trying new foods. This makes me want to get on the road and go, go, go! Hey Donna, great to hear from you, glad you love to travel as well. Hope you can visit Indonesia for the food! I actually watch Mark every night after work, it brings back good memories when I was living in Phrakanong and On Nut in Bangkok, hoping to go back someday and bring my family with me, thanks for the exciting blogs you put up bro! Thank you very much Darwin! Bubur Pulut Hitam for the win. Def one of my fave desserts. Hey Syaf, that was really good!